Men’s undercut hairstyles. Undercut hairstyles are the total in thing these days! 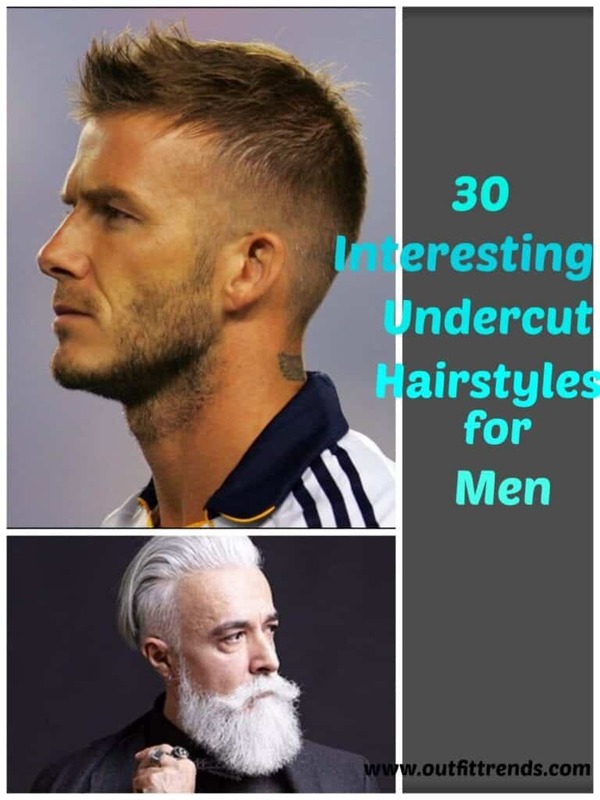 Well, the truth has been spoken, men who go for undercut styles are absolutely on the right track, the best thing about undercut hairstyles is that with one basic idea you can actually pull off many number of looks, and its absolutely hassle free. Undercut hairstyles have been trending in men’s hairstyle for a while, even now women are going for it. As contrary to old beliefs, now even men can rock out their looks and alter their style and keep themselves up to date with whatever style and fashion is prevailing in the town. So men from all walks of life, this is for you all. You can absolutely rock the undercut and to facilitate that, we’ve plenty of ideas for you. Don’t mistake short hair or undercut for summers, some people tend to think that way but you can add multiple layers of clothing and carry out your undercut with medium length hair without giving any summer vibes. Who says aging means only short and sleek hair, you can totally go for undercuts even in middle ages, when your hair starts turning grey, and you can compliment it with beards and some good dressing. Perfectly trimmed hair along a perfectly trimmed beard automatically makes the men look more handsome and stylish, so why not go for a undercut along this look? This looks 100 times more attractive! Who say men who go for blonde hair don’t look good. 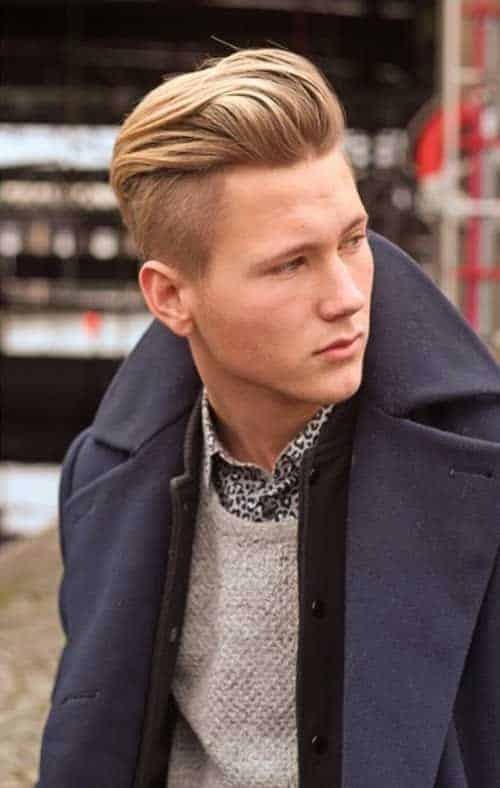 Well we can prove you wrong, blonde hair with an undercut can look really good if it is carried with a perfect attire, which include cardigan or coats paired with a pair of jeans. Trust us, you won’t look weird carrying an undercut to work, all you need is the right style to carry it. Pair your pants with a dress shirt and a long coat. Go for an undercut which isn’t very typically bold and you’re all set to go! Men with many tattoos can go for undercut, this will further give them a rugged look. To make the look even more intense they can add full beard, and that’s about it. Who would imagine going for an undercut if all of your hair have turned white? Well its daring but honestly they do not look bad at all! Don’t be afraid to experiment and just do it. Ready for a beach day, or some fun day with your friends, wear s simple tee paired with pants and pull on your favorite shades, the entire attire will compliment your undercut. An undercut with the rest of the hair highlighted can do wonders, but you have to ensure that the color of highlights blend in with the rest of the hair, so it doesn’t make you look bad. You can totally impress your girlfriend’s parent even if you have an undercut, don’t worry what kind of impression they’ll get about you. Dress well, wear a coat, trim your beard and you are all set to impress. Casually carrying your undercut is probably the best thing to do. Be it the gym look or simply going out to pick up some groceries you can look absolutely perfect if your hair are in the right undercut style. Yes, you read that right, stylish haircuts are not only for men who want to look stylish but can be carried out by anyone. Be it the guys who wear glasses, they can also pull off the undercut even with maintaining their typical attire. Mohawk hairstyle is definitely’s not everyone cup of tea, but if you can pull it right, then you are the game changer. And yes everyone like game changers. Most boys are fan of spikes, what they can do is combine an undercut and let the rest of the hair remain in spikes. Easy, isn’t it? In mood to experiment with your undercut? Men can totally opt for designing their undercuts, in different patterns which don’t make their hairstyle look weird with their personas. David Beckham is a style symbol and looking at him we can see that he is a great fan of undercuts, altering it in many styles he is usually seen rolling an undercut, usually with a trimmed beard. There is a perception that Mohawk hairstyle can’t be carried at formal events, well actually this isn’t the case, if you dress well than your Mohawk looks amazing even at formal events. You can also opt for a hair cut that create multiple volume layers in your hair along an undercut. Undercut is one hairstyle that looks really cool with even colored/ dyed hair. Be it brunettes or blondes. With the undercut you can also tie up your hair in a bun, this looks stylish and neat and can be easily carried with multiple looks. The Crew cut involves an undercut with medium fading hair, this gives the transition effect to your hair. This is simple undercut with a little longer hair, at the other side. Men can carry it well for casual look. If you’re not too comfortable with long hair for Mohawks you can always opt for shorter hair and pull them up in spikes to give the illusion of length. You can make a statement with your undercut, a sleek full shaved hairline right above your undercut is one way to make yourself standout among others. One way to really look neat in undercuts is to combine it with medium length beards, this adds a lot of decency to your entire look. Yes, you can also opt for similar looks, by being barely bearded and rock an undercut like a pro! Casual outings call for an entire casual look, combine your favorite tee with a simple pair of pants and put on your favorite shades and head out.